INVESTING IN PRO-ATHLETES — THE NEXT BIG THING? The Super Bowl XLVIII was surprisingly a near blowout of the Seattle Seahawks over the Denver Broncos. But the outcome of the game certainly had deeper impacts than just the jubilation or heartbreak of fans’ hearts. Professional championships of this scale mean large-scale activity in the stock market. Have you ever dreamt of the stock market and Fantasy Football in one? If so, that dream has come true. A company called Fantex, Inc. has come up with a unique way to sell an athlete’s brand. 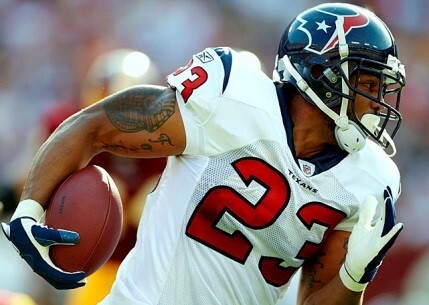 Right now, investors can purchase stock in professional athletes such as San Francisco 49ers tight end Vernon Davis (420,000+ shares) and Houston Texans running back Arian Foster (over 1 million shares). The stock available is common stock, which is associated with the performance and value of the athlete. Fantex, Inc. states: “An athlete’s brand value is made up of certain income generated throughout both their playing and post-career. This includes income from items such as playing contracts, endorsements, and appearance fees, a percentage of which Fantex, Inc. is entitled to receive under the brand agreement.” In other words, the company owns part of the player. Unlike the NYSE and the rest of the stock markets, Fantex, Inc. brings a new idea of trading stocks to the world; not only do they want to sell the brand of athletes but entertainers as well! But as with any stock investment, there is always risk involved. There are tons of questions roaming through your head, such as will the player get injured, what if he has off-the-field issues, or what will he do after retirement? These are major unforeseeable risks that investors would like to be aware of, especially when taking a chance on an NFL player, a baseball player, a golfer, or an entertainer. I know what athletes and entertainers I would want to invest in – celebrities and athletes on the rise like Cristiano Ronaldo, Bruno Mars, and Taylor Swift. I would also like to see how the TU Investment Group would fair if they invested in celebs and wonder who they would invest in? For more information on investing and purchasing stock, visit Fantex.com. Who knows, you may hit the jackpot one day!